This chapter discusses an interdisciplinary and transdisciplinary project to understand the interactions of agriculture, climate, and water resources in the Central Great Plains as a coupled natural-human system. We focus on the Smoky Hills Watershed in Kansas, where we gathered socioeconomic, hydrological, and climatic data, along with ecological data on fish species. The project involved substantial stakeholder engagement, which was complicated by post-truth attitudes about climate science and environmental regulation by some groups. We discuss the challenges of team management, stakeholder engagement, and data integration for modeling, notably the incorporation of stakeholder support for environmental policy in the context of extreme climatic events. 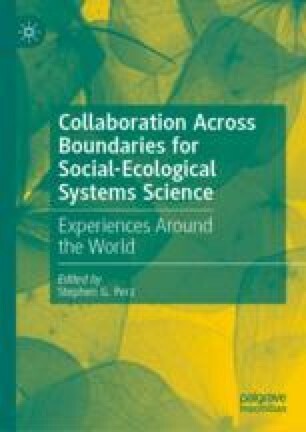 We conclude by offering a framework for good collaborative practice to manage the complications of crossing boundaries in transdisciplinary research and outreach. This research was funded by the National Science Foundation (NSF #1313815 Dynamics of Coupled Natural and Human Systems). Errors of interpretation and otherwise are the responsibility of the authors. The Kansas Cooperative Fish and Wildlife Research Unit is a joint effort among Kansas State University, the U.S. Geological Survey, U.S. Fish and Wildlife Service, the Kansas Department of Wildlife, Parks, and Tourism (KDWPT), and the Wildlife Management Institute. Peck, J. C. (1986). Groundwater Management Institutions in Kansas. Journal of Irrigation and Drainage Engineering, 112(3). https://ascelibrary.org/doi/10.1061/%28ASCE%290733-9437%281986%29112%3A3%28203%29.